The world seems to have gone yoga-mad. Everywhere you turn there are new classes springing up and so many different varieties – bikram, hatha, ashtanga, strala… the list goes on. Your friends have told you to give it a try but you’re not sure what it involves or how you should start. Well, hopefully this new blog will start to answer some of your questions. Yoga means a lot of things to a lot of different people. To some, it’s a good exercise regime that strengthens and tones muscles. To others, it’s a complete philosophy of life, shaping the way they think, feel and interact with the world. Back in the mists of time, yoga was divided into five branches. Each of these was seen to be a stage in a journey of self-awareness and spiritual fulfilment. This is the branch you’ve probably heard of as it’s the most common in the West. It focuses on a series of movements called ‘asanas’ that flow together in co-ordination with your breathing. The aim of Hatha yoga is to create union between body and soul through the practice of physical movement. Everyone’s heard of ‘good karma’ but where does this phrase come from? If you practice Karma yoga, you believe that what you’re experiencing today is a reflection of your actions in the past. In other words, if you have good thoughts, good deeds and good words, they’ll lead you to a more enriched and happy life. The focus is on ‘selfless service’ and choosing a better future, free from negativity. This is considered to be one of the most difficult branches of yoga and it’s certainly difficult to explain in simple terms! Jnana means ‘wisdom’ and its ultimate goal is a sense of ‘oneness’ with the universe. To practice Jnana, you need strong determination, will power and an open, enquiring mind. Often referred to as the yoga of love, Bhakti encourages you to feel a sense of love, gratitude and devotion in every aspect of your life and towards everything that surrounds you. In its simplest form, you focus on actions that nurture and nourish your heart and the heart of others. It’s a very beautiful concept – the idea that by giving love, you’ll receive it in return. Raja Yoga is the oldest system of yoga. Yoga means ‘union’ and ‘Raja’ means ‘royal’ so this is the ‘royal path’ to bring union of your mind, body and spirit. The path is divided into eight steps – self-control, discipline, physical exercises, breath exercises, withdrawal of the senses, concentration, meditation and, finally, complete realisation. It’s not for the faint-hearted – to practice it fully takes time, determination, self-discipline and dedication. At the Karma Centre, we believe it’s important for modern yoga to stay true to the fundamental beliefs contained in the five branches above. Too often in the West, yoga is practiced without any mindfulness or care – resembling a work-out at the gym rather than a spiritual practice. If you’re thinking of taking up yoga, make sure you find a teacher with qualifications from a recognised body. All our teachers are highly qualified by the Yoga Alliance or British Wheel of Yoga meaning they’ve undergone rigorous training. It’s worth trying out a couple of teachers until you find one you like and gel with. A well-qualified teacher will help you to respect your body and not push it beyond its limits. 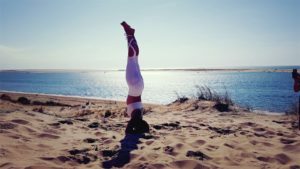 We’re hard-wired to compare ourselves to other people but, when practicing yoga, it’s really important to recognise that your body is anatomically unique and different to other people’s. Your teacher will guide you to be mentally ‘present’ during your yoga practice by focusing on your breath in the various movements. This will ensure that you don’t strain or hurt your muscles and you’ll also start to appreciate the sense of calm and mental stillness of your practice. Why not give yoga a try? Book a class online at The Karma Centre today. All our classes are graded with Level 1 being the most basic suitable for beginners as well as experienced yogi’s. Level 2 being a little more intense suitable for all abilities. Level 3 being extremely challenging requiring a good level of mobility & fitness.